Screen 4 at the Apollo Vue cinema just south of Piccadilly Circus for a series of short documentaries entitled ‘Cultures in Transit’. Showing as part of the Raindance Film Festival, documentaries are one of the most interesting areas of contemporary filmmaking. 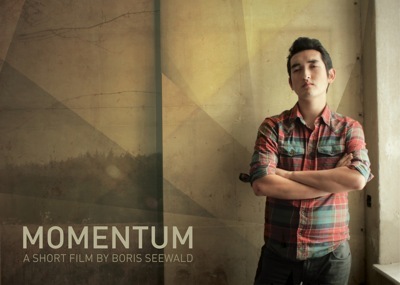 Momentum by Boris Seewald is an exuberant story of a young man who discovers his love of dance through the unusual medium of tortilla chips. Carried by the enthusiasm of the main character it is filmed in a cement-walled room that gives full attention to the plaid shirted star and his dancing. The film credits a cast list, with the the main character played by Patrick Hanno, so to what extent this is fiction is unclear. The title The Death Row confuses the issue of what is happening in the short film by Maryam Ebrahimi. Filmed in Afghanistan, a row of shrouded figures stand unmoving in central Kabul. Bystanders assume this is a punishment and that the people will be executed. The credits give a different explanation. Inspired by an attack on 15 girls who were going to school, this is an attempt to bring attention to the rights of females to have an education. As none of the locals had any idea that that was what it was about it doesn’t seem likely that it will succeed in Kabul, but the film does raise the issue everywhere that it seen. Live with the Sea by Yuichiro Nakano shows a little of the life of a fisherman in Japan who lost his wife in the Tsunami. When the water hit his first thought was for his boat, which he went to save. Subsequently losing his wife has changed him and made his adjust his priorities. He now gives fish that he catches to people in temporary housing. This is a short that conveys Norio Nizuma’s feelings of guilt and attempts to assuage them and attempts to show some good coming out of an horrendous occurence. The miniaturisation and lowering in cost of digital equipment has made documentary film making accessible for almost everyone. Of course this ease has also allowed people to point cameras at subjects that have little intrinsic value. At their best short documentaries can be a means of exploring the world and understanding more about it and other people, as these three documentaries manage to do well.